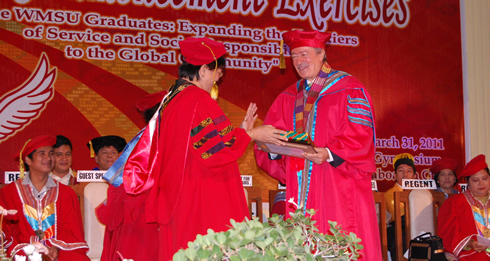 Mr. Jose Rodriguez, Instituto Cervantes Director and second batch commencement exercises guest of honor is shown receiving a token from the Prsident, Dr. Grace J. Rebollos. Mr. Jose “Pepe” R. Rodriguez, Director of Instituto Cervantes de Manila, Spain’s cultural center in the Philippines, challenged the graduates of the Western Mindanao State University (WMSU) to uphold their positive values, pursue their life’s goal with passion, and continue to enhance their capabilities and seek opportunities to express these capabilities. Holding on to one’s positive values, Rodriguez told the graduates, will ensure that one will be part of the solution of society’s woes. He likewise urged them to decide what they truly want to do and pursue this dream with passion which also means hard work. “A little sweat will bring you to places and you will enjoy its fruits,” he stressed. “You are the product of an institution whose vision mission states in part, to educate well-trained, development oriented and forward looking professional and technical manpower for the socio-economic, political and technological development of the region and the coutry,” Rodriguez reminded the graduates. As such, according to Rodriguez, from now on, the graduates are bound to enflesh their alma mater’s desire in their pursuits.